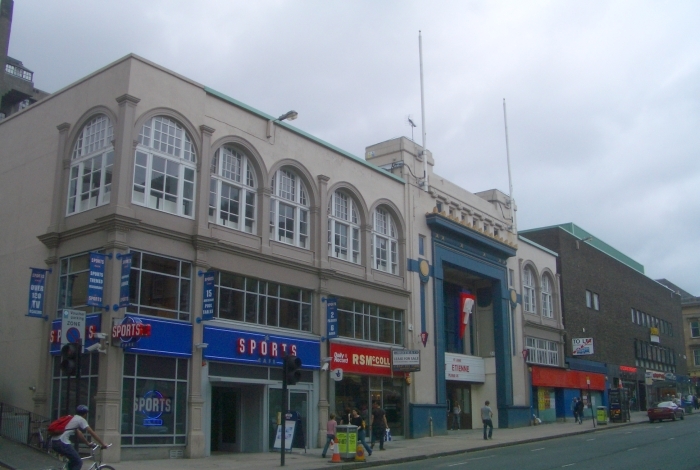 The Regal opened in November 1929 as ABC's flagship cinema in Glasgow. Designed by CJ McNair, the 2,359-seater was a thorough conversion and extension of a much older building, with a rather complex history. Originally built in 1875 as the Diorama, featuring canvases of historic events, then the Panorama in 1878, where the images were animated by having the canvases scroll, then Hubner's Ice-Skating Palace in 1885. Interior as the Hippodrome It had been fitted with electricity in 1888, one of the first buildings in the city to have this feature, making it ideal as the site of Glasgow's first public film showing, in May 1896 - a fact which used to be commemorated by a plaque outside. Later it was converted to the Hippodrome, and featured a large circus ring complete with water tank underneath. From 1904 to 1927, it was the home of Hengler's Circus, and films were shown here regularly in the off-season. Around 1927, it was largely rebuilt as the Waldorf Palais dance hall, which featured a car-park on the ground floor with the dance hall above, accessed via stairs from a main entrance on Sauchiehall St. A large window overlooked the Scott Street at one end of the hall. The portion of the facade featuring the arched windows visible in pictures of the cinema dates from this period. The car park was entered to the left of the building, and cars exited to the right. It seems that this construction work was done with an eye to it being potentially converted to a cinema. McNair's plans of 1929 clearly show that much of the fabric of the building was retained from its previous incarnation, including much of the roof structure and the unusual arrangement of having the main auditorium upstairs above a car park - a neccessity given the steep slope of Scott Street rising up from Sauchiehall Street. The mezzanine level of the dance hall became the stalls floor of the cinema. He replaced two of the arched window bays with a new landmark portico entrance, set off centre, and flanked on either side by shop units. The small ground-floor foyer had payboxes on either side, and the luxurious main foyer waiting and cafe spaces above were reached by twin staircases, or one of two lifts. The huge auditorium sat 2,359 in stalls and balcony, decorated in autumnal colours, with three arches bays on the splay walls, each decorated with painted landscape scenes (much like his similar interior scheme at Hamilton). A giant cupula above the balcony was lit by concealed lighting. There was a 3/12 Compton organ; images of it and organist Gerald Shaw c.1938 can be seen here and here, courtesy of Frank Watson and the Scottish Cinema Organ Trust. The interior was modernised in 1955, with a wide-screen fitted, and the side-wall decoration simplified, with a pink, silver and turquiose colour scheme. Photos from June 1979 courtesy of Scottish Screen Archive. Full gallery here. The main building was renamed the ABC1 in October 1967, when a large extension housing a second screen was erected alongside (imaginatively entitled ABC2). This had 922 seats on a single level in stadium style, with a deeply curved screen and full 70mm facilities. It was the first new cinema to open in Scotland since the war, and was designed to feature the latest modern designs and fully licensed bar by Leslie Norton and CJ Foster. Kine Weekly reported the opening of the £250,000 building as being "one of the biggest showmanship events in Glasgow's history." From a new entrance on Sauchiehall Street, patrons entered a foyer at ground level, containing a pay box and sales kiosk, then ascended a wide double staircase on the right, passing the advance booking hall to the first floor waiting lounge and licensed bar. A vomitory led from here to the centre of the massive auditorium, which had a screen size of 50ft by 23ft, wall-to-wall gold curtains and comfortable red seats. The original ABC1 auditorium closed for subdivision in 1979, to form four new screens seating 980, 306, 206 and 192. 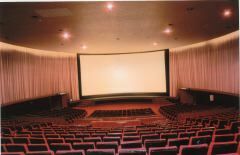 The largest screen here used the full original balcony, with a new screen constructed in front of it. A gallery of photos taken during the subdivision work is here, and shows the amount of work involved in levelling the stalls floor, extending the balcony, and constructing new steelwork within the auditorium. The 5-screen ABC Film Centre opened on 13 December 1979. The cinemas changed owners and names numerous times, to Cannon, MGM, and then finally back to the ABC again. The 1967 extension, which was by then called Screen 1 of the 5 screen complex, closed on 29th October 1998, and the remaining screens finally closed their doors on 14 October 1999. After sitting empty for several years, the large site has now been converted into pubs, restaurants and a music venue (also called the ABC - complete with traditional-style ABC logos - and entered through the original cinema foyer). The conversion was dramatic, with the interior largely stripped out back to the bare brick, although a few original 1929 features - such as the star-shaped terrazzo flooring and some decorative scrollwork in the foyer - have survived. The main facade was also extended to the left by an additional window arch at this time. Despite the dramatic alterations over the years, some brickwork from the oldest part of the building can be still seen on the Scott Street side of the building here. View here of the roof of the complex, courtesy of Aedan Mcghie. Archive pictures of the interior c.1995, showing what were then numbered Screen 2 (the 1967 extension), and Screen 1 (the original balcony), are available here courtesy of Kevin Gooding. Archive pictures of the exterior of the Regal can be seen here, taken in 2001 while the building was sitting derelict. 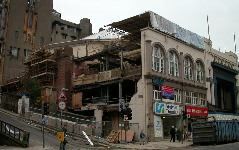 A gallery of photos taken in 2002 during the dramatic stripping out and rebuilding work can be seen here.